The Anaheim Ducks and the Washington Capitals played their way to overtime on Feb. 6. There was 1:49 on the clock, and the Washington Capitals and the Anaheim Ducks were tied, with two goals apiece. Both could have used the two points a win would bring: The Capitals were in a tight battle with the New York Rangers, the New York Islanders and the Pittsburgh Penguins for control of the Metropolitan division, and the Ducks could further extend their Pacific division lead. Since 2010, the Caps have played 125 games that were tied at the end of regulation, including a remarkable 28 during the 2013-14 season. That number puts them, fittingly, in a tie with the Islanders, atop the league. Those two teams are not alone in their quest for extra hockey, however; 25 percent of games this season (through Tuesday) have reached overtime. If that number stands, it will be the highest yearly percentage of overtime games in the league’s history. At the end of tie games, teams across the league don’t play to win — they play not to lose. It wasn’t always this way. For most of the NHL’s history and through the 1998-99 season, a team earned two points for a win in regulation or overtime, zero points for a loss, and one point for a tie. But in 2005, the NHL mandated shootouts at the end of overtime, which prompted a change in the point structure. Now, the winner would get two points and the overtime loser one. (From 1999 to 2005, the loser of an overtime game also received a point, but matches could also finish tied, with each squad earning a point.) By and large, the new structure encourages teams in tie games to try to play for overtime, where the total number of points awarded to the teams increases by 50 percent (three vs. two). In today’s NHL, overtime frequently benefits both teams, which is why teams that are tied often holster their sticks. Take a look at this chart, which shows the expected goal (EG) rate per minute2 over the course of an NHL contest. EGs use shot distance and location from the NHL’s play-by-play data to estimate the number of goals that we expect the two teams to combine for during each minute of play. There’s something different about that third period. At the end of a tie game, benches shorten, and coaches change their behavior. Reirden, for example, says he is loath to send out a defenseman who might take an unnecessary risk, preferring a guy he knows will stay home and limit the opposition’s attacking chances, even if that means sacrificing a shot at getting a goal. It’s tempting to say, meh, more overtime equals more fun. Fans love it — it’s free hockey after all. And four-on-four, sudden-death free hockey at that. Perhaps relatedly, league revenue has skyrocketed since the 2004 lockout, reportedly reaching an all-time high of $3.7 billion in 2014. 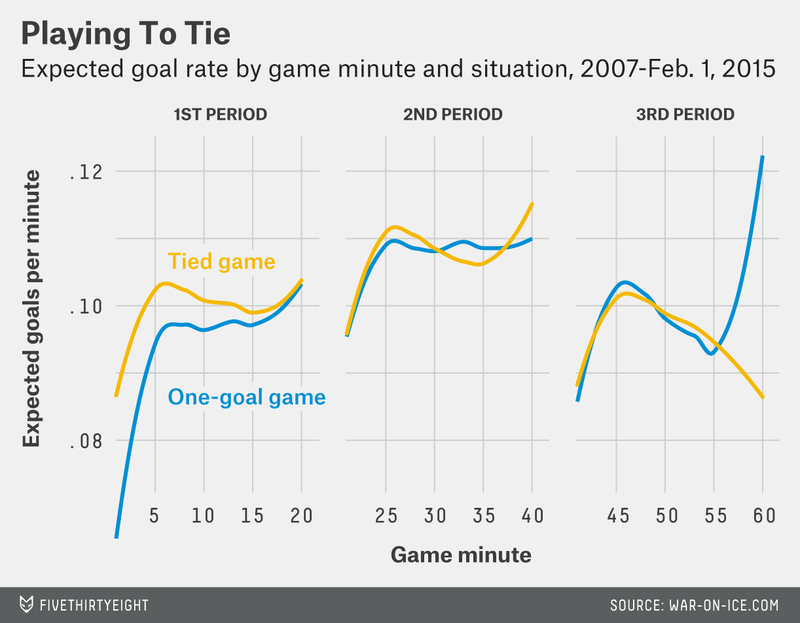 But more overtime leads to a radically different game. For starters, the number of overtime games increases as the season advances; the postseason chase makes teams desperate to take advantage of the extra point available. While overtime rates have been consistently higher in the current point system, the late-season change is dramatic. Roughly two-thirds of the way through the season, OT rates spike; in the old system, without the loser point, rates plummeted late in the season. 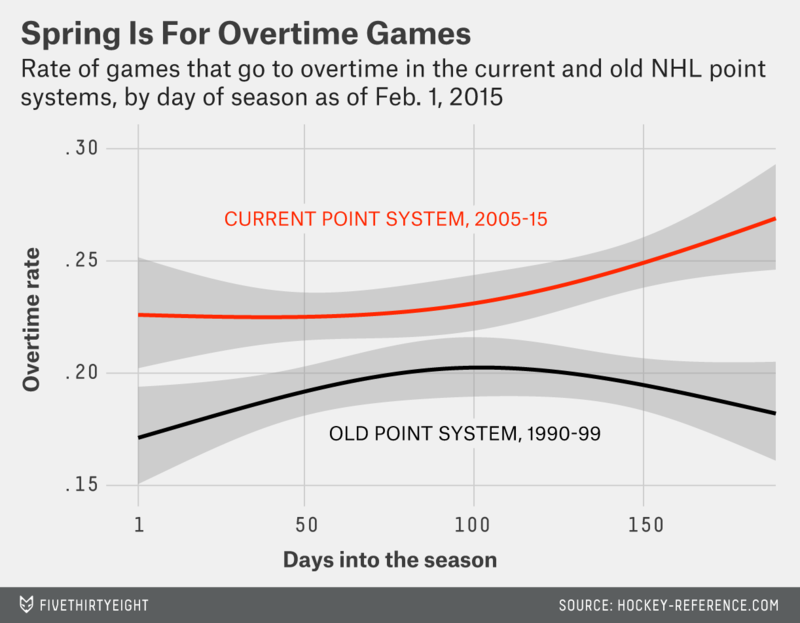 Spring is now the NHL’s overtime season. The other way the game changes: Nonconference games become a lot more passive for both teams. The flip side of that is that teams try to win more often against in-conference teams. “You have the mindset that you don’t want to have shared points, especially against teams in your own conference and more specifically against teams in your own division,” Reirden said. The data shows that, during tied games, teams’ expected goals are higher during conference games than out-of-conference ones. The largest differences in aggressiveness between in-conference and out-of-conference games occur at the end of tied games, when overtime is imminent. This suggests that teams are satisfied to receive at least one point when playing a nonconference opponent but are more likely to try to win in regulation against a team with whom they are competing for a playoff spot. If you corner people who work in the NHL, they’ll admit that teams cater their behavior and offensive aggressiveness based on a variety of seemingly unintended incentives. “There is a lot more strategy at the end of the games than I remember,” Reirden said.5 The game is changing — but is it for the better? The NHL considered the merits of alternative point systems as far back as when it instituted the new one. But nothing has come of it. Much like players in a tie game late in the third period, the league seems uninterested in altering the status quo. The Capitals won the game in Washington in a shootout. Expected goals (EGs) are calculated by tallying the goal probabilities of each unblocked shot attempt, where the goal probabilities are estimated by using shot distance and location in logistic regression models of goal outcomes (yes/no). For more information, see this set of slides from Carnegie Mellon Ph.D. student Sam Ventura’s recent presentation at February’s Ottawa hockey analytics conference. The data includes all games from the beginning of the 2007-08 season through Feb. 1 of 2015. EGs per tied-game minute were calculated by dividing the total number of EGs from when the game was tied during each one-minute interval by the total number of tied-game seconds in that interval, with that result multiplied by 60. A corresponding process was used to estimate the EG rate for one-goal games. To prevent our results from being skewed, we dropped any shot in the last three minutes that occurred with a pulled goalie. The lines have been smoothed using a Loess smoother. You may also notice the higher number of EGs in the second period, relative to the first and third. This can be accounted for by a longer line change in the second period, among other reasons. Data is from 1990 to 1999 for the old point system and 2005-current for the new. The lines are smoothed using quadratic splines, assuming a binomial distribution for the number of OT games on each date. We dropped the lockout-shortened 1995 and 2013 seasons for this graph and accounted for Olympic years by subtracting off the number of days that teams were given for a break. We would be remiss if we didn’t point out that academics have covered how the rule changes have affected strategy; see published work from, for example, Jason Abrevaya (2004) and, yes, Lopez (2013) in the Journal of Sports Economics.